For children with asthma, the lungs and airways can become inflamed due to certain triggers like pollen, exercise or respiratory infection. Asthma can cause daily symptoms that can affect a child’s ability to play, participate in sports, attend school and sleep. If left unmanaged, children can experience asthma attacks, which can be dangerous. While childhood asthma can’t be cured, learning to assess your child’s symptoms, recognize warning signs, and manage symptoms can keep your child’s asthma under control. The signs and symptoms of asthma can vary from child to child and may worsen or improve over time. 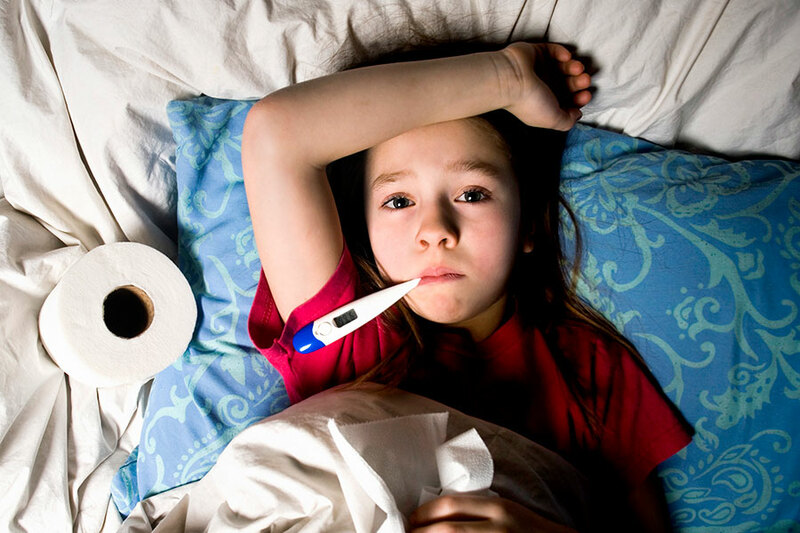 Your child could have only one symptom, such as a lingering cough, or may have several. The first sign of asthma in a child is typically recurrent wheezing, often caused by a respiratory virus. The National Heart, Lung, and Blood Institute grades the severity of asthma based on the symptoms. The grades are used as a guide for developing treatment plans and can help your child’s physician decide if treatment should include daily preventive medication or rescue medications as needed. The severity of your child’s asthma can change over time. Knowing the severity can help you understand how to best manage the asthma and control symptoms in the case of a flare-up. Intermittent asthma: Symptoms occur no more than two times a week. The flare-ups are short, lasting only a few hours to a few days, and the child does not have any asthma-related issues between flare-ups. Nighttime symptoms occur less than two times a month. Mild persistent asthma: Symptoms occur more than two times a week, but not daily. Flare-ups may affect the child’s activity levels and abilities. Nighttime symptoms occur more than two times a month, but no more than once a week. Moderate persistent asthma: Symptoms occur every day. The child needs to use rescue medications every day. Flare-ups may affect the child’s activity levels and abilities. Nighttime symptoms occur more than once a week. Severe persistent asthma: Symptoms occur multiple times a day, and the child often experiences flare-ups that cause a significant decrease in their physical activity. Nighttime symptoms occur frequently. When children have asthma, the goal of their treatment is to keep symptoms under control at all times. Having well-controlled asthma means having few or no symptoms, few flare-ups, no limitations on physical activity, minimal use of rescue inhalers, and few side effects from medications. Expand a section below to learn tips to help take control of your child’s asthma. Tracking your child’s asthma symptoms can help you and the doctor stay aware of any improvements or issues throughout a treatment plan. Use a notebook to document how your child feels, including the days he or she feels sick. Record the date and your child’s symptoms, such as wheezing and coughing; issues such as reduced activity and trouble sleeping; when and how often your child needs to take rescue medication; and the dosages of all the medication your child takes. Note what triggered the asthma symptoms or flare-up, or side effects from the medication. A peak-flow meter measures the flow of air out of the lungs, and it is used to measure the maximum amount of air flow when your child forcefully exhales. This helps test the health of the lungs. Your child’s doctor can teach you how to use the peak-flow meter and tell you at what peak-flow number your child should take rescue medications, and at what number you should bring the child to see a doctor. Finding what triggers your child’s asthma can take some time but will help you avoid flare-ups or more severe reactions. Some of the common triggers are mold, pollen, viral infections, cold weather, pet dander, and exercise. You may want to have your child tested for allergies if you think these may be making your child’s asthma worse. Speak with your child’s doctor for help identifying these triggers and the steps you can take to avoid them. After your child experiences a few flare-ups, you may start to learn the early warning signs and know when a flare-up is going to occur before obvious symptoms even start. Learning and identifying these early warning signs can help you and your child prepare to manage the flare-up. You may notice changes in your child’s mood or breathing, or your child may complain of feeling ill or different. Know your child’s early warning signs and be ready to adjust or administer medications, as needed. Make sure you understand all the medications your child takes, including the names, the correct dosages, and when your child should take each one. Always follow the instructions for the medication your child should take and for when and how they should take it. There are several types of medications for asthma. Maintenance medications prevent asthma symptoms and must be given every day. Rescue medications are given to treat asthma symptoms when they develop. Keep a list of all your child's medications and when he or she takes each one, in case of an emergency or if your child needs to see a different doctor. Take your child for regular check-ups and make sure the doctor tests your child’s breathing. Go at least every six months, or more often if your child has frequent asthma symptoms. The doctor can monitor your child’s condition, ensure that the medications are working correctly, and adjust the dosage or kind of medication as needed. Make sure your child gets a yearly flu vaccine. Children with asthma who get the flu are at higher risk for flare-ups and developing more serious illnesses. You are an important member of your child’s medical team and play an important role in keeping your child healthy. Becoming educated about asthma, and about your child's asthma, will help you and your child manage the condition effectively. Learn everything you can while in the doctor’s office. Take any literature they may have, ask any questions you have, and have them teach you how to use any necessary medical devices and what to expect from medications. Community programs, support groups, and resources can be a great help in managing your child’s asthma and improving their health and quality of life. Learn about the community programs and resources at Hasbro Children’s Hospital. Was your child one of those students with back to school jitters? Many children experience that nervous feeling at the start of a new school year. Soon, most settle into the routine. Routine visits to the doctor are an important part of a child’s health and development. But for some children, and perhaps some adults, a trip to the doctor can be cause for distress. Exercise can often be a scary word for many people, especially for adults who have not made personal fitness a priority. Early diagnosis and treatment of asthma can help control your child’s day-to-day symptoms and can help prevent asthma attacks. Take your child to see a doctor if they experience any of the symptoms of asthma. If your child is diagnosed with asthma, creating an asthma action plan will help you, your family, and other caregivers monitor your child’s symptoms and know what to do in the event of an asthma attack. In severe cases of asthma, your child may struggle to breathe and their chest and sides may pull inward as they try to breathe. They may also have an increased heartbeat, sweating and chest pain.If you have any questions or concerns, or would like to make an appointment, call the Pediatric Respiratory and Immunology Center at 401-444-6540.